Cheaper than nuclear fusion but just as many rays. When it comes to lighting up the night the Ricky Stator 8" Universal Race Light Kit and 200 watt high-output stator are the next best thing to towing another class G2 star into the solar system - and way cheaper. We have a bone or two to pick with the fabulous folks at Ricky Stator and we'll get to that right off. First we are ticked off that Ricky Stator doesn't make a HID helmet light. Because of this incredible oversight on their part we were recently forced to deal with a competitor and rewarded with the snotty attitude and poor customer service we have come to expect from this particular vendor. After two phone calls to make sure that the proper kit was shipped they still got it wrong! Where were you when we needed you, eh? The other thing is that the H4 Halogen bulb shipped with our Ricky Stator Race Light lost its high beam filament in the first few hours of use. Fortunately we were able to find a replacement at a gas station and were on our way. All that aside the Ricky Stator light and high output stator are the shazz. Just don't drop the stator on your foot when removing it from the mailbox. The 8" Universal Race Light Kit is available in both a 55 watt street legal version that will work with most stock stators and a 100 watt version that requires the high output stator. 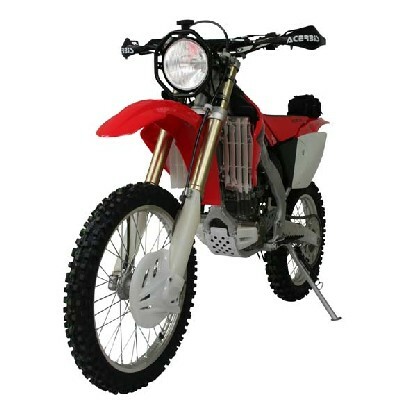 Either kit will mount on virtually any dirt bike. 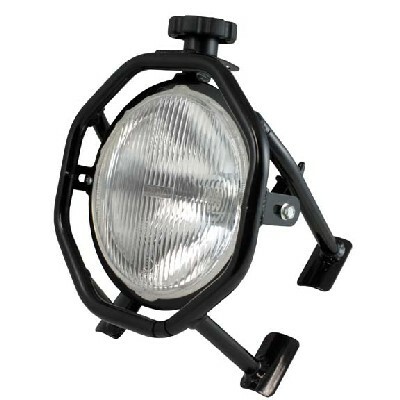 The light and frame are remarkably lightweight. The frame is powdercoated black and comes with an installed wiring harness and a sturdy high/off/low toggle switch on the left side of the frame. The back of the light is coated black and light leakage non-existent. The unit is well sealed against the elements and no water has penetrated either the seal around the lens or the rubber boot on the back of the bulb in spite of numerous stream crossings, rainstorms, and car washes. The aiming knob on top is sturdy and easy to operate. Fit and finish are first rate. The entire unit extrudes high adventure and bulletproof chic. Installation of the light and frame is a snap and the compact, lightweight design makes the whole unit remarkably non-intrusive on the front of the bike. A really useful feature of the light is the use of a 100/90 H4 bulb that is available at many auto parts stores for around $10. The low cost makes obtaining and carrying a spare bulb a no-brainer. Lately we have been using a PIAA 135/125 GT-X H4 high-output bulb that, while expensive, provides a better quality light for less power used. Our light has already been involved in several dunkings and two violent high-speed getoffs and continues to work like a champ. We can find little to fault with this unit. We had our 200 watt high-output stator professionally installed by the crew at Pocatello Power Sports. 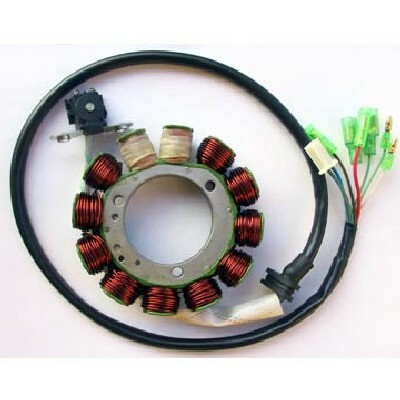 The stator is configurable in several different output arrangements and we chose to have it set up to power the headlight and wiring harness for our HID helmet light separately. The folks at Ricky Stator are very easy to work with over the phone and the wiring diagrams on their website are useful, complete and correct. Everything worked perfectly right out of the box. We had an opportunity to evaluate the Ricky Stator 8" race light on an XR650R head to head with its leading competitor on a similar bike during the Tour of Idaho - and based on our brief comparison feel that the Ricky Stator unit is superior in every way. We later conducted an extensive solo test of the Ricky Stator light during our 24-hour, 800 mile Brief Tour of Idaho. Low beam (left) and high beam (right) patterns are shown below. The 2300 lumen high beam is exceptionally bright for a flood type pattern and lack of useful light was not a check on our throttle hand. 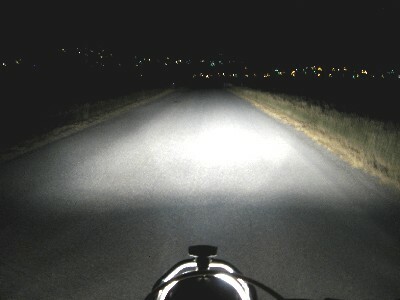 The leading edge of illumination in the photo below is more than 1/2 of a mile in front of the bike. The stator output is such that even at idle the brightness of the light does not drop off (photos shown are at fast idle). The Ricky Stator 8" Universal Race Light Kit and 200 watt High Output Stator are among the best upgrades we have made to our BRP. 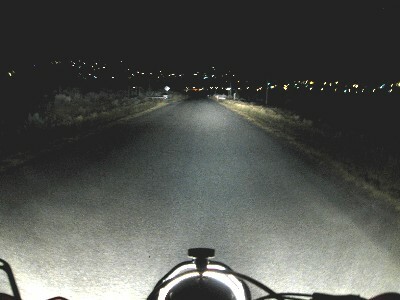 Night riding is simply a gas with adequate illumination. We cannot recommend this kit from Ricky Stator highly enough.